Baltimore Struggles To Protect Children From Lead In Paint : Shots - Health News Despite the attention to lead in water, the biggest health risk to children is still from lead paint. The city of Baltimore banned lead paint way back in 1950, but children continue to be poisoned. 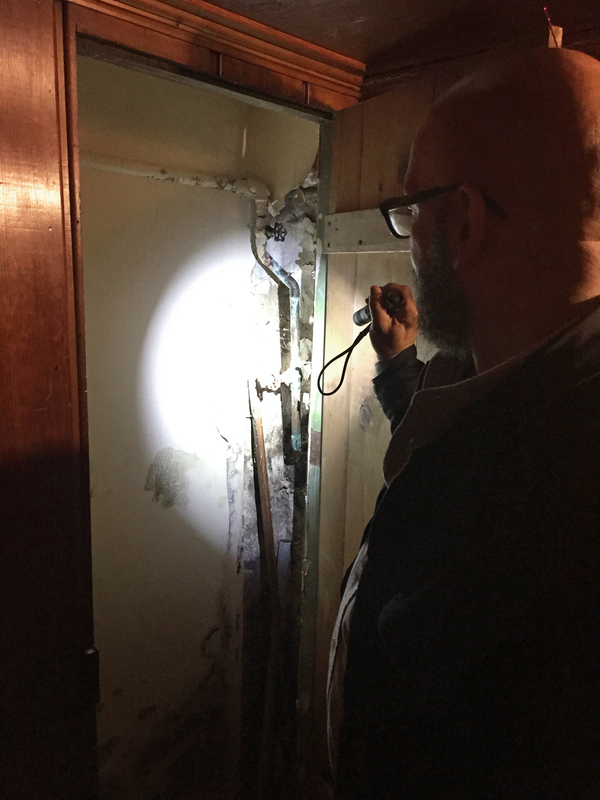 Hector Moreno checks a basement for lead paint in Baltimore. He is an environmental assessor with Green and Healthy Homes. When a doctor found that Kenicer Carty's 1-year-old daughter had a dangerously high level of lead last year, it triggered an alarm of sorts. Officials sent an inspector to Carty's 1930 row house in northeast Baltimore. It turned out that every single window had hazardous chipping lead paint. The city contracted with the nonprofit Green and Healthy Homes Initiative to replace the windows and inspect her house. They will also fix a leak in a bedroom wall and near the toilet where water pools, because moisture prompts paint to break down. While it's all welcome help, it has been six months since Carty's daughter tested positive for lead. She hopes the girl won't suffer the irreversible behavior or learning problems that lead can cause, but she hasn't told anyone about the poisoning. "Because I don't want people to judge," she says. "You know, we live in a society where you're labeled for just the simplest thing." Baltimore banned lead paint in 1950, nearly 30 years before the rest of the country. Grass-roots activism emerged early here, with a volunteer effort among parents in 1986. That became the national Coalition to End Childhood Lead Poisoning, which spawned the Green and Healthy Homes Initiative. Baltimore has seen a dramatic decline in cases of lead poisoning, down 86 percent since 2002. But despite these decades of effort, hundreds of Baltimore children are still poisoned every year. Nearly half a million children suffer from lead poisoning nationwide, most of them living in neglected and old houses in low-income neighborhoods. The problem drew national attention last year after the death of Freddie Gray, the young, black Baltimore man fatally injured in police custody. Court documents show that Gray had a devastatingly high blood-lead level as a toddler, an amount medical experts say surely would have harmed his ability to focus and learn in school or even hold a steady job. His family later sued a property owner over the poisoning and received an undisclosed settlement. Ruth Ann Norton, a longtime activist who heads Green and Healthy Homes, says it's taken the country far too long to adapt policy to science, which has shown that any level of lead is harmful to children. "For decades, we were telling families, kids who had levels of 2, 3, 4, 9, that they were really safe," she says. "That was the message, and we knew they weren't safe." Maryland's legal threshold for triggering action on lead poisoning is still 10 micrograms per deciliter of blood. The city of Baltimore has lowered its threshold to 5, in line with a change by the Centers for Disease Control and Prevention in 2012. City Health Commissioner Leana Wen says Baltimore also has universal lead testing, but it's a challenge to carry out. She wants funding for instant testing in doctor's offices. "A primary care doctor may recommend that the child is tested," she says. "However, by the time that parent goes to a lab and then gets that report back, some kids may fall through the cracks during that time." Maryland's governor has announced that the state will also start testing every 1- and 2-year-old for lead. Norton says that's great, but it's not a solution. "There's only one cure for lead poisoning, for the irreversible, high-cost impact of lead poisoning," she says, "and that's prevention." Maryland has a housing registry that lets people check for rental units certified as lead safe. It originally covered only houses built before 1950, but recently was expanded to include houses built up until 1978, when the federal government banned lead paint. Tenants can also report problems. "The good news is that Maryland has been very aggressive," says Ben Grumbles, Maryland's secretary of the environment. "They have the right to notify their landlord under Maryland law if they see chipping, peeling or flaking paint and to get the landlord to fix that." But extensive reporting by the Baltimore Sun finds landlords don't always fix the problem. And state auditors say the registry of hundreds of thousands of homes is riddled with errors. Grumbles says the state, along with the EPA, is investigating one private inspector who may have wrongly certified nearly 400 rental units as lead-free. He also says the state has sent out thousands of letters to track down property owners who are not on the registry and is updating its computer technology. But even when the law works, it requires landlords to take action only after testing finds a child with a lead level of 10. Legislation that would have lowered that legal threshold by half recently failed to pass after landlords opposed it. Thomas Tompsett of the Maryland Multi-Housing Association says expanding landlords' liability would, perversely, lead to less affordable housing. "Unfortunately the more we are sued and the more risk reductions we have to do, all those costs unfortunately pass on to the tenant, in most cases," Thompsett says. Beyond state and local failures, activists complain that the federal government has chronically underfunded lead poisoning prevention efforts. "There should be a program initiated to remove lead from every home in the country," says attorney Brian Brown, who sues landlords on behalf of lead-poisoned children. "There's no doubt in my mind that if rich white kids were the ones being poisoned by lead, this problem would have been solved 75 years ago." Norton says studies show a large-scale investment would more than pay off, saving money on everything from social services and education to the criminal justice system. "The kids will read better," she says. "They're going to be less likely to be violent. They will live healthier. Why wouldn't we do it?" Since the Flint, Mich., water crisis drew national attention, Norton has been pushing the Obama administration to create a national task force to take up that very question.